This article is about the reform movement within the Ottoman Empire. For other uses, see Young Turks (disambiguation). Young Turks (Turkish: Jön Türkler, from French: Les Jeunes Turcs) was a political reform movement in the early 20th century that consisted of Ottoman exiles, students, civil servants, and army officers. They favoured the replacement of the Ottoman Empire's absolute monarchy with a constitutional government. Later, their leaders led a rebellion against the absolute rule of Sultan Abdul Hamid II in the 1908 Young Turk Revolution. With this revolution, the Young Turks helped to establish the Second Constitutional Era in 1908, ushering in an era of multi-party democracy for the first time in the country's history. After 1908, the Young Turks' initial umbrella political party, the Committee of Union and Progress (CUP; Turkish: İttihat ve Terakki Cemiyeti), began a series of political reforms and military modernization across the Ottoman Empire. However, the CUP soon began to splinter as many of the more liberal and pro-decentralization Young Turks left to form an opposition party in late 1911, the Freedom and Accord Party (also known as the Liberal Union or Liberal Entente), with much of those staying in the CUP favoring a generally nationalist and pro-centralization policy. In a year-long power struggle throughout 1912, Freedom and Accord and the remaining members of the CUP vied for control of the Ottoman government, the year seeing a rigged election by the CUP and a military revolt by Freedom and Accord. 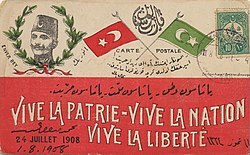 The struggle between the two groups of Young Turks ended in January 1913, when the top leadership of the CUP seized power from the Freedom and Accord in the Raid on the Sublime Porte. The subsequent CUP-led government was headed by interior minister and Grand Vizier Talaat Pasha. Working with him were war minister Enver Pasha and naval minister Djemal Pasha. These "Three Pashas", as they came to be known, exercised absolute control over the Ottoman Empire from 1913 to 1918, bringing the country closer to Germany, signing the Ottoman–German Alliance to enter the Empire into World War I on the side of the Central Powers, and carrying out the Armenian Genocide. Following the war, the struggle between the two groups of Young Turks revived, with the Freedom and Accord Party regaining control of the Ottoman government and Three Pashas fleeing into exile. Freedom and Accord rule was short lived, however, and the empire soon collapsed. 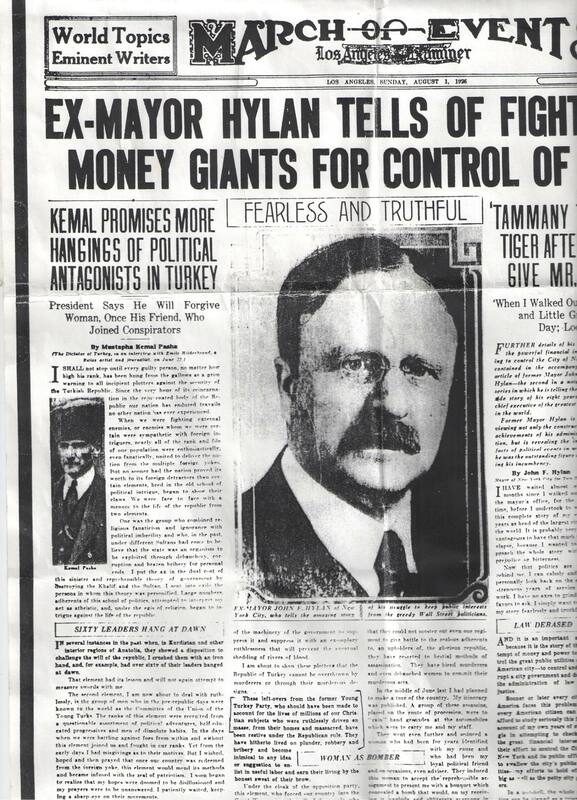 The term "Young Turk" is now used generally to denote a member of an insurgent group within an organization (often, although not always, a political party) advocating change, sometimes radical change, in that organization. 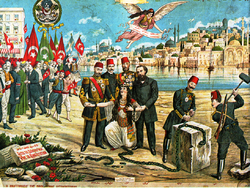 Inspired by the Young Italy political movement, like other revolutionary societies[which], the Young Turks had their origins in secret societies of "progressive medical university students and military cadets", namely the Young Ottomans, driven underground along with all political dissent after the Constitution of 1876 was abolished and the First Constitutional Era brought to a close by Abdul Hamid II in 1878 after only two years. The Young Turks favored a re-instatement of the Ottoman Parliament and the 1876 constitution, written by the progressive Midhat Pasha. The First Congress of Ottoman Opposition was held on 4 February 1902, at 20:00, at the house of Germain Antoin Lefevre-Pontalis, a member of the Institut de France. The opposition was performed in compliance with the French government. Closed to the public, there were 47 delegates present. The Armenians wanted to have the conversations held in French, but other delegates rejected this proposition. The Second Congress of Ottoman Opposition took place in Paris, France, in 1907. 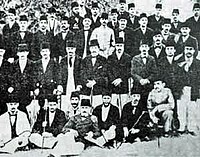 Opposition leaders including Ahmed Rıza, Sabahaddin Bey, and Khachatur Malumian of the Armenian Revolutionary Federation were in attendance. The goal was to unite all the parties, including the Young Turks' Committee of Union and Progress, in order to bring about the revolution. The Young Turks became a truly organized movement with the Committee of Union and Progress (CUP) as an organizational umbrella. They recruited individuals hoping for the establishment of a constitutional monarchy in the Ottoman Empire. In 1906, the Ottoman Freedom Society (OFS) was established in Thessalonica by Mehmed Talaat. The OFS actively recruited members from the Third Army base, among them Major Ismail Enver. In September 1907, OFS announced they would be working with other organizations under the umbrella of the CUP. In reality, the leadership of the OFS would exert significant control over the CUP. In 1908, the Macedonian Question was facing the Ottoman Empire. Tsar Nicholas II and Franz Joseph, who were both interested in the Balkans, started implementing policies, beginning in 1897, which brought on the last stages of the balkanization process. By 1903, there were discussions on establishing administrative control by Russian and Austrian advisory boards in the Macedonian provinces. The ruling House of Osman was forced to accept this idea, although for quite a while they were able to subvert its implementation. However, eventually, signs were showing that this policy game was coming to an end. On May 13, 1908, the leadership of the Committee of Union and Progress, with the newly gained power of its organization, was able to communicate to Sultan Abdul Hamid II the unveiled threat that "the [Ottoman] dynasty would be in danger" if he were not to bring back the Ottoman constitution that he had previously suspended since 1878. On June 12, 1908, the Third Army, which was in Macedonia, began its march towards the Palace in Constantinople. Although initially resistant to the idea of giving up absolute power, Abdul Hamid was forced on July 24, 1908, to restore the constitution, beginning the Second Constitutional Era of the Ottoman Empire. The unity among the Young Turks that originated from the Young Turk Revolution began to splinter in face of the realities of the ongoing dissolution of the Ottoman Empire, especially with the onset of the Balkan Wars in 1912. On November 2, 1914, the Ottoman Empire entered World War I on the side of the Central Powers. The Middle Eastern theatre of World War I became the scene of action. The combatants were the Ottoman Empire, with some assistance from the other Central Powers, against primarily the British and the Russians among the Allies. Rebuffed elsewhere by the major European powers, the Young Turks, through highly secret diplomatic negotiations, led the Ottoman Empire to ally itself with Germany. The Young Turks needed to modernize the Empire’s communications and transportation networks without putting themselves in the hands of European bankers. Europeans already owned much of the country’s railroad system, and since 1881, the administration of the defaulted Ottoman foreign debt had been in European hands. During the War, the Young Turk empire was "virtually an economic colony on the verge of total collapse." At the end of the War, with the collapse of Bulgaria and Germany's capitulation, Talaat Pasha and the CUP ministry resigned on October 13, 1918, and the Armistice of Mudros was signed aboard a British battleship in the Aegean Sea. On November 2, Enver, Talaat and Djemal, along with their German allies, fled from Istanbul into exile. The conflicts at the Caucasus Campaign, the Persian Campaign, and the Gallipoli Campaign affected places where Armenians lived in significant numbers. Before the declaration of war at the Armenian congress at Erzurum, the Ottoman government asked Ottoman Armenians to facilitate the conquest of Transcaucasia by inciting a rebellion among the Russian Armenians against the tsarist army in the event of a Caucasian Front. Jakob Künzler, head of a missionary hospital in Urfa, documented the large scale ethnic cleansing of both Armenians and Kurds under the Three Pashas during World War I. He gave a detailed account of deportation of Armenians from Erzurum and Bitlis in the winter of 1916. The Armenians were perceived to be subversive elements (a fifth column) that would take the Russian side in the war. In order to eliminate this threat, the Ottoman government embarked on a large scale deportation of Armenians from the regions of Djabachdjur, Palu, Musch, Erzurum, and Bitlis. Around 300,000 Armenians were forced to move southwards to Urfa and then westwards to Aintab and Marash. In the summer of 1917, Armenians were moved to the Konya region in central Anatolia. Through these measures, the CUP leaders aimed to eliminate the Armenian threat by deporting them from their ancestral lands and by dispersing them in small pockets of exiled communities. By the end of World War I, up to 1,200,000 Armenians were forcibly deported from their home vilayets. As a result, about half of the displaced died of exposure, hunger, and disease, or were victims of banditry and forced labor. Around this period, the CUP's relationship to the Armenian Genocide shifted. Early on, Armenians had perceived the CUP as allies; and the beginnings of the Genocide, in the 1909 Adana massacre, had been rooted in reactionary Ottoman backlash against the Young Turks. But during World War I, the CUP’s increasing nationalism began to lead them to participate in the genocide. In 2005, the International Association of Genocide Scholars affirmed that scholarly evidence revealed the CUP "government of the Ottoman Empire began a systematic genocide of its Armenian citizens and unarmed Christian minority population. More than a million Armenians were exterminated through direct killing, starvation, torture, and forced death marches." Positivism, with its claim of being a religion of science, deeply impressed the Young Turks, who believed it could be more easily reconciled with Islam than could popular materialistic theories. The name of the society, Committee of Union and Progress, is believed to be inspired by leading positivist Auguste Comte's motto Order and Progress. Positivism also served as a base for the desired strong government. After the Committee of Union and Progress grabbed power in the 1913 coup, it embarked on a series of reforms in order to increase centralization in the Empire, an effort that had been ongoing since the last century’s Tanzimat reforms under sultan Mahmud II. Many of the original Young Turks rejected this idea, especially those that had formed the Freedom and Accord Party against the CUP. Other opposition parties against the CUP like Prince Sabahaddin’s Private Enterprise and Decentralization Association [tr] and the Arab Ottoman Party for Administrative Decentralization, both of which made opposition to the CUP’s centralization their main agenda. In regards to nationalism, the Young Turks underwent a gradual transformation. Beginning with the Tanzimat with ethnically non-Turkish members participating at the outset, the Young Turks embraced the official state ideology: Ottomanism. However, Ottoman patriotism failed to strike root during the First Constitutional Era and the following years. Many ethnically non-Turkish Ottoman intellectuals rejected the idea because of its exclusive use of Turkish symbols. Turkish nationalists gradually gained the upper hand in politics, and following the 1902 Congress, a stronger focus on nationalism developed. It was at this time that Ahmed Rıza chose to replace the term "Ottoman" with "Turk," shifting the focus from Ottoman nationalism to Turkish nationalism. These left-overs from the former Young Turk Party, who should have been made to account for the millions of our Christian subjects who were ruthlessly driven en masse from their homes and massacred, have been restive under the Republican rule. […] They have hitherto lived on plunder, robbery and bribery and become inimical to any idea, or suggestion to enlist in useful labor and earn their living by the honest sweat of their brow… Under the cloak of the opposition party, this element, who forced our country into the Great War against the will of the people, who caused the shedding of rivers of blood of the Turkish youth to satisfy the criminal ambition of Enver Pasha, has, in a cowardly fashion, intrigued against my life, as well as the lives of the members of my cabinet. As to the fate of the Three Pashas, two of them, Talaat Pasha and Djemal Pasha, were assassinated by Armenian nationals shortly after the end of World War I while in exile in Europe during Operation Nemesis, a revenge operation against perpetrators of the Armenian Genocide. Soghomon Tehlirian, whose family was killed in the Armenian Genocide, assassinated the exiled Talaat Pasha in Berlin and was subsequently acquitted by a German jury. Djemal Pasha was similarly killed by Stepan Dzaghikian, Bedros Der Boghosian, and Ardashes Kevorkian for "crimes against humanity" in Tbilisi, Georgia. The third pasha, Enver Pasha, was killed in fighting against the Red Army unit under the command of Hakob Melkumian near Baldzhuan in Tajikistan (then Turkistan). ^ a b c Hanioğlu 1995, p. 12. ^ Akçam 2006, p. 48. ^ a b Balakian 2003, p. 143. ^ Alkan, Mehmet Öznur (May 1999). "Osmanlı'dan Günümüze Türkiye'de Seçimlerin Kısa Tarihi" (PDF). Setav. p. 50. Archived from the original (PDF) on May 12, 2013. Retrieved April 14, 2013. ^ a b Wilson, Mary Christina (June 28, 1990). King Abdullah, Britain and the Making of Jordan. Cambridge University Press. p. 19. ISBN 978-0-521-39987-6. ^ Akçam 2006, p. 153. ^ "young Turk". Merriam-Webster dictionary. Retrieved May 22, 2018. ^ a b Demonian 1996, p. 11. ^ Balakian 2003, p. 136. ^ Karsh, Efraim (2001), Empires of the Sand: The Struggle for Mastery in the Middle East, Harvard University Press, p. 327 . ^ Schaller & Zimmerer 2008, p. 8. ^ International Association of Genocide Scholars 2005. ^ Landau, Jacob M. (1984). Atatürk and the Modernization of Turkey. Brill. p. 108. ISBN 90-04-07070-2. ^ "Los Angeles Examiner, 1 August, 1926". Retrieved August 7, 2018. ^ Demonian 1996, p. 69. ^ Demonian 1996, p. 101. ^ Akçam 2006, p. 353. Akçam, Taner (2006), A Shameful Act: The Armenian Genocide and the Question of Turkish Responsibility . Balakian, Peter (2003), The Burning Tigris: the Armenian Genocide and America’s response . Demonian, Hripsimé (1996), The Sick Men of Europe, Gyumri State Pedagogical Institute . Fisk, R, The Great War for Civilisation: The Conquest of the Middle East, Vintage, ISBN 978-1-4000-7517-1 . Hanioğlu, M. Şükrü, The Political Ideas of the Young Turks . International Association of Genocide Scholars (June 13, 2005). "Letter to Prime Minister Erdogan". Genocide Watch. Archived from the original on June 4, 2007. Retrieved June 30, 2007. Schaller, Dominik J; Zimmerer, Jürgen (March 2008), "Late Ottoman genocides: the dissolution of the Ottoman Empire and Young Turkish population and extermination policies—introduction", Journal of Genocide Research, 10 (1): 7–14, doi:10.1080/14623520801950820 . ——— (2008), Dissent and Heterodoxy in the Late Ottoman Empire: Reformers, Babis and Baha'is, Istanbul: ISIS Press . Look up young Turk in Wiktionary, the free dictionary. Wikimedia Commons has media related to Young Turks movement.